Description: This demonstration shows that an object with the same index of refraction as a liquid will look transparent when immersed in it. Spread a few paper towels down where this demo will be used. 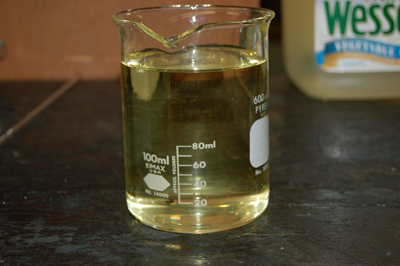 Fill the large beaker up with wesson vegetable oil, taking into account that the small beaker will also be going in later (so don't fill it up all the way). 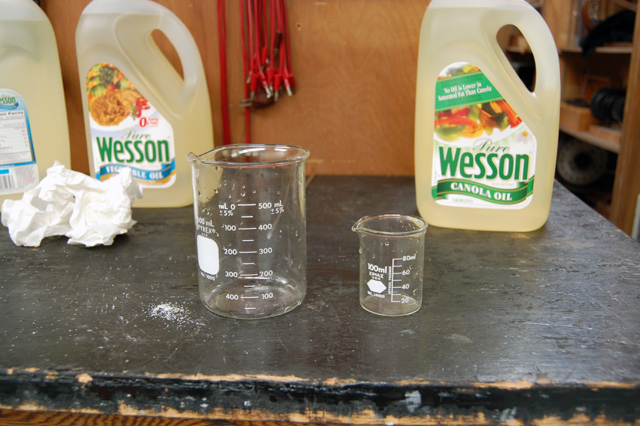 When the professor is finished, pour the vegetable oil back into the main wesson container. You will need to clean the pyrex beakers out with soap and water. Show students the large pyrex beaker. Explain that it has Wesson vegetable oil in it. Show them the small pyrex beaker. Fill it up with the wesson oil. 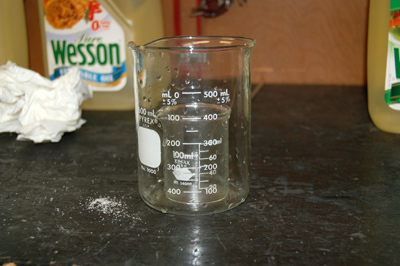 Lower the small beaker into the large beaker, and note that it "disappears". This is because the index of refraction of pyrex and wesson vegetable oil is about the same. Since the light does not bend, it's as if there is nothing there, which makes it seem like there is only oil. A video camera can be used for lage classes. Point the camera at the side, since from the top the lid of the small beaker can be seen eaiser.